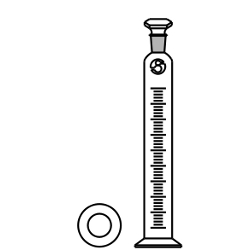 In order to keep pace with the never-ending demands of customers, we are involved in offering a wide range of Graduated Calibration Cylinder (AFM Graduated Calibration Cylinder). With the aid of our experienced workers, we are devoted towards manufacturing an exquisite range of Graduated Cylinder. 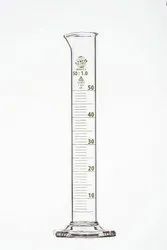 Being a client-centric organization, we are engaged in manufacturing and supplying Graduated Measuring Cylinder. Glass agencies are manufacturer of graduated cylinder plastic. Adding to the range of round & hexagonal base cylinders are the Pentagonal ones. Polylab now offers you a wide range of cylinders with different bases to choose from. Prominently raised graduation & excellent contact clarity are among the other features of these cylinders. We are a most trusted name amongst the topmost companies in this business, instrumental in offering high quality array of Graduated Cylinder. We are a unique entity in this industry, actively committed towards manufacturing and supplying a premium quality range of Glass Graduated Cylinder. Owing to affluent industry expertise and practice, we are involved in providing an extensive range of Graduated Cylinder. - accuracy of glass 1. - pour out volume 50 ml, 1 ml/ one division. - allowable error, +-0. 50 ml.